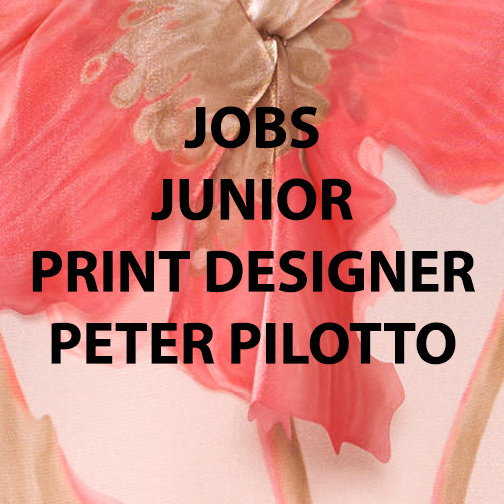 Job Description • *IMMEDIATE START AVAILABLE** The Junior Print Designer works closely with the RTW Design team to turn ideas into reality whilst adding an additional layer of creative interpretation. The role understands a wide range of techniques and displays a passion to explore all options those techniques present. The Print Designer liaises closely with the Atelier & Production team, is excited about product innovations & enthusiastic about optimizing the product before it goes into Production. Only applicants with Print Portfolios will be Considered. MUST HAVE AT LEAST 2 YEARS EXPERIENCE AS PRINT DESIGNER. • Inform Design team on limitations in terms of repeat dimensions, colour restrictions etc. • Carry out strike off inspections ensuring prints meet quality standards • Create lay plans for placement instructions. • Highly organised with an ability to multi-task effectively in a fast-paced environment. Peter Pilotto and Christopher De Vos are the creative force behind the luxury womenswear label Peter Pilotto. Pilotto is half-Austrian, half-Italian and De Vos is half-Belgian, half-Peruvian. Their fusion of cultures is reflected on their catwalk; constructed silhouettes, couture fabrics and intricate prints are all part of the label’s DNA. Pilotto first showed at London Fashion Week in September 2008, with the support of the British Fashion Council’s NEWGEN scheme. In 2009 they received the Swarovski award for “Emerging Talent: Womanswear”; in 2011 they received the Fashion Forward sponsorship for their Spring/Summer 2012 collection, supported by the British Fashion Council. In 2014 they were awarded the prestigious British Fashion Council/VOGUE Fashion Fund and, most recently, in May 2015 were awarded the Inaugural Swarovski Collective Award.